Are you in the market for a new computer? Don’t know where to start or what you should be looking for? Well this post is for you. As a technology consultant and coach I often asked “What should I get?” If you have ever been in the market for a new electronic gadget you are all too familiar with the non help you get in the stores. You must realize that the clerks are there to sell a product and they will tell you anything whether they are on commission or not. You also have store personnel who have no clue at all. They just work there. I want to share with you a few tips or questions that you need to have answered before you go in any store. Once you have these answered and settled in your mind you will be able to go to the store with confidence and more importantly knowledge. You will certainly come home with what you need and nothing more. So let’s dive in! What Is The Main Use Of Your Computer? What Do You Need To Be Able To Do? This is where you really want to think about what you use your computer for and what are the basics that you really need. Do you need just email functionality or be able to browse the Internet? Do you use it strictly for business or do you need it for both home and business use? All of these answers to these questions will help flesh out the blueprint that you will need when it is time to go purchase your new computer. The answers will help you pin down what you really need and not be oversold by the salesperson or come home with something that you didn’t even want. This is usually a tricky one for people. Most people fail here because they have not done any research to find out what are the going rates for computers in the first place. So that is where you want to start. When you go in a store just browse the computer section to familiarize yourself with what computers are going for. From the least expensive to the most expensive. You might also want to note what features come with each price point. Don’t be afraid to comparison shop. Don’t put all of your eggs in one basket at one store. Remember knowledge is power! Once you have familiarized yourself with pricing then you can come up with what you are willing to spend for the features that you NEED in a computer. This is an important one. You don’t want to get a computer with a ton of bells and whistles when you have only mastered turning it on. Remember the sales person will make everything sound easy peasy to you but once you get home you are on your own. So you need to make sure that the computer you get is not bloated down with a lot of programs and other shiny tricks to the point where you get frustrated and don’t even use the thing because it is too over your head. It happens everyday. Or if you aren’t all that computer savvy think about getting some training either free or paid that can get you up to speed on what you need to know in order to operate your machine. What Programs Will You Need? All computers come with what is known as bloat wear. This is extra software loaded onto the computer that you didn’t even ask for. With that being said, you need to figure out what programs you will need that don’t come with the computer and are extra costs. The most important piece of software that you need is virus protection software. Do not skip this. Because it only takes one bad virus to ruin your new investment beyond repair. After that you will probably need a PDF reader which is free from Adobe and some type of Office Software like Microsoft Word, Powerpoint, Excel, etc. But if you do not want to pay an arm and a leg for Microsoft’s offerings you can go the open source route and get Open Office for free that will let you read and save Microsoft Office file types. After you get the basics you can figure out what other software programs you will need depending on what you will be using your computer for. Here you will need to know if you need speakers or a larger screen or if you will need to get a USB hub or a router of some type. Is your set up at home wireless? Do you need a printer or scanner? This is the time to answer all of these questions before you head out and get sold some riverfront property in Kansas! Only get what you absolutely need for your new computer and what you will be actually using. Will I Need Help Setting It Up? I’m pretty sure you will need help getting everything set up even if you follow directions. It just helps having someone else setting it up right the first time and making sure that everything works like it should. This is especially true if you will be setting up a wireless network in your home at the same time. So look into whether the store where you purchase the computer from offers this service or if you can get a neighborhood kid to come over and help you get set up. Don’t try to do it alone if you don’t know what you are doing because the last thing you want to do is ruin your new purchase because you plugged in the wrong cords. Now for a word on wireless setup. If you decide to go wireless remember to have it set up with a password so that anyone driving down your street can’t just jump on to your open wireless network and possibly get onto your computer. It can happen. And if you go through a phone company to set up your wireless computing remember to choose a new password because everyone knows that they use your home phone as a password most of the time. Let’s make sure not to make it easy for the identity thieves out there. After answering all of these questions you should now be in a great position to go confidently and boldly to purchase your new computer. Because you have done your homework and researched and thought about what you need you will not be oversold by a pushy or non-knowing clerk at the store. You will also not be sold something that isn’t compatible with what you have. You have all of the power and can now make an informed decision. Even after all of the planning and research you still don’t feel comfortable going by yourself then by all means hire someone who specializes in this type of thing (hint, hint, ME) to come with you to the store to make sure that you are making the right decision. You can be in and out in under two hours depending on if you go to multiple stores. You can even have that person help you set up everything once you have made your purchase. You can’t go wrong with that. I hope this post has given you some insight into choosing the right computer for your needs and given you the confidence and knowledge you need to make the right decision and purchase for your family. If you are needing help in this area be sure to check out my Tecnology Organizing Services here. We have a lot of rainy days in Nashville. For some they would want to crawl back into bed and take a nice long nap. But I choose instead to knock out some of the more boring tasks in my business on those days by organizing my digital files on my computer. This isn’t a terribly exciting thing to do. And most people would find it down right boring. But on rainy days you can put on a little music and put your timer on for 1 hour and go through your computer files and see what you need and don’t need anymore. Clean out your installed programs. I will be getting a new computer soon so I want to see what I have installed on my current computer and what I don’t need anymore. 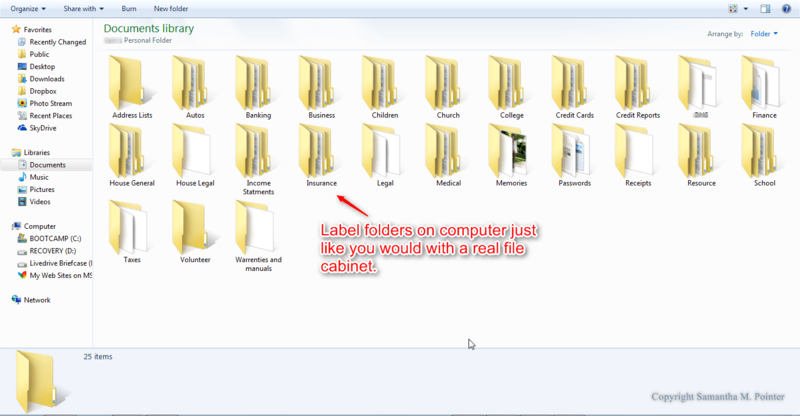 Organize your file folders on your computer. Try to organize them and name them like you would a physical file cabinet. Use broad folder names. Organize the pictures on your hard drive. Do you have duplicates? Can you upload them to Picasa, Flickr or an external hard drive? Get rid of any that you don’t need. Backup your computer. There is no time like the present to make sure that all of your files are backed up. At least take the time to schedule a backup on your computer. It’s very easy to do. Organize the bookmarks in your web browser. You may have some that you no longer care about. The website that you bookmarked may even have shut down. I ran into that recently. It’s a good idea to purge through your bookmarks just like anything else from time to time. Well that’s it. You don’t have to do all of it today or in one day. Just pick one thing from the list and get started. Just an hour or two will put you far ahead of the game than you were before. This week is Home Based Business Week. If you are like most home based businesses your home office is probably a little disorganized. Because you are so busy being both owner, accountant, secretary and all the other hats that a business has, you have probably neglected getting your space organized. That’s okay. I’m going to show you 5 easy steps to organizing your home office that you can do with minimal time. All I’m going to ask you to do is set aside 30 minutes to 1 hour everyday to work on this very important task to get your home office in order. When your office is in order I am certain that you are going to see an increase in productivity which translates to your bottom line. So let’s get into it. Desk – The first area is your desk. Obviously this is the most important part of your home office besides your files and computer. Your desk is where you do most of your work and so you want that to be as organized as possible. Only have the essentials on your desk. I know it is tempting to get all of these decorative items to put on your desk but you must keep this to a very bare minimum. Your desk is for working and you want to have space to actually do that. Filing System – The next area you want to work on is your filing cabinet. If you don’t have a filing system set up then by all means set one up. You can get great tips by clicking here that I shared over on help-organize-life.com. To keep a handle on files I like to schedule a time of the year to do purging. Also you want to take about 1 hour every week or less looking through your files and seeing what can go and what can stay. Mail – For your mail you want to have a catchall basket, not a huge one either, where you put all incoming mail. This can be placed near your front door. Then when you have time that day go through and act on each piece of mail. Throw away junk, shred sensitive items and file the rest. If you need to do an action on a piece of mail then write it down on your to do list or calendar and put the mail in your pending action file on your desk. Calendar – Your calendar is not just for keeping you on schedule. Use your calendar to log important task that you need to do that day. It doesn’t matter if you use a paper calendar or electronic or both. Just get into the habit of referring to your calendar at the beginning of everyday so that you will stay on track. If you use more than one calendar make sure that you sync them. I use Google calendar as well as a paper based calendar to log my blogging duties. I also like to have my calendar in monthly mode because I like to see the big picture. Computer – Your computer is just as important as your desk and your files, so keep it organized too. 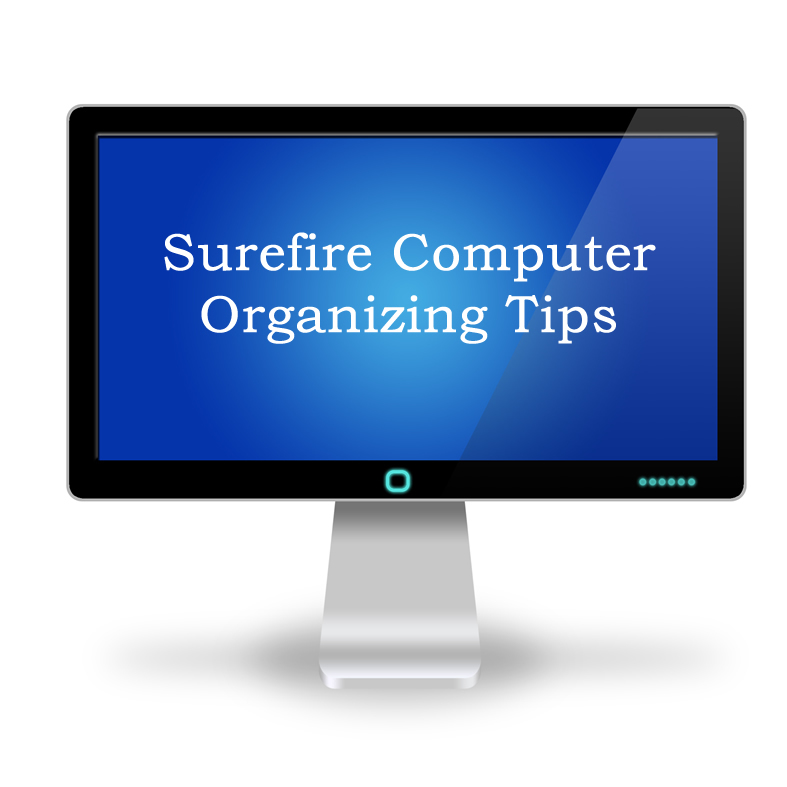 You can read my tips to get your computer organized here. I hope that these tips help you to make the most of running your home based business and keeping your home office in order. 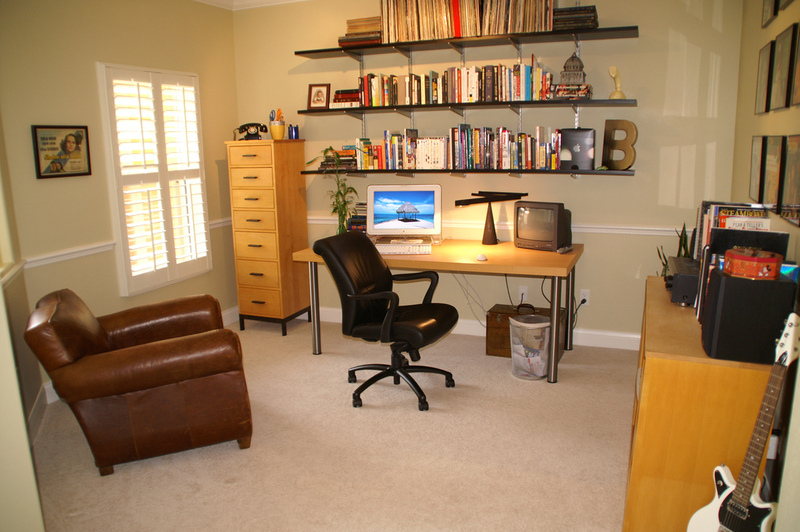 For more home office organizing quick tips check out my article at help-organize-life.com where I share my home office story. Now that you are on your way to home office organization success why not pick up a free book for work at home moms that shows you how to start your own website. I use it to run my website Help-Organize-Life.com and I think you will find it jam packed with information that you can use. And best of all it is FREE! Click on the image below (affiliate link) to get your free WAHM-IT Masters Course today!